Who wants to work at Google? / anu - Journey of Analytics Team / Comments Off on Who wants to work at Google? In this tutorial, we will explore the open roles at Google, and try to see what common attributes Google is looking for, in future employees. 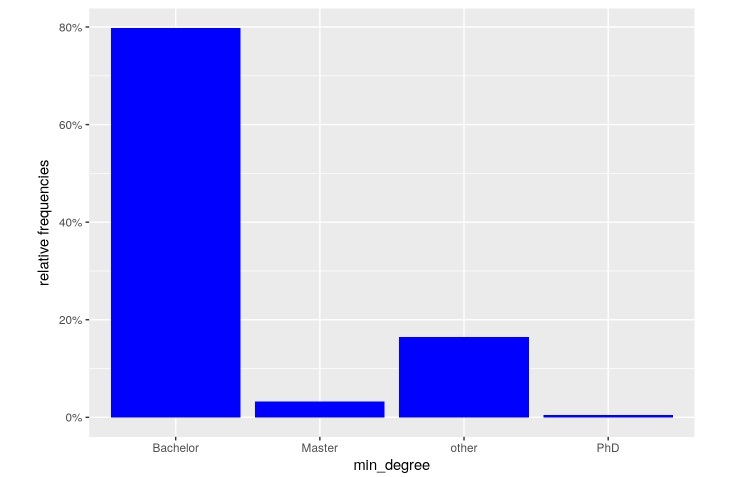 This dataset comes from the Kaggle site, and contains text information about job location, title, department, minimum and preferred qualifications and the responsibilities of the position. Using this dataset we will try to answer the following questions: You can download the dataset here, and run the code on the Kaggle site itself here. Which departments have the most openings? What are the minimum and preferred educational qualifications needed to get hired at Google? What categories of roles are the most in demand? First we look at which departments have the most number of open roles. Surprisingly, there are more roles open for the “Marketing and Communications” and “Sales & Account Management” categories, as compared to the traditional technical business units. (like Software Engineering or networking) . Let us see how many roles are full-time and how many are for students. As expected, only ~13% of roles are for students i.e. internships. Majority are full-time positions. To check this, we investigate how many roles have the phrase either in the job title or the responsibilities. As shown in the graph below, ~20% of the roles are related to Cloud infrastructure, clearly showing that Google is making Cloud services a high priority. Here we are basically parsing the “min_qual” and “pref_qual” columns to see the minimum qualifications needed for the role. If we only take the minimum qualifications into consideration, we see that 80% of the roles explicitly ask for a bachelors degree. Less than 5% of roles ask for a masters or PhD. However, when we consider the “preferred” qualifications, the ratio increases to a whopping ~25%. Thus, a fourth of all roles would be more suited to candidates with masters degrees and above. Google is famous for hiring engineers for all types of roles. So we will read the job qualification requirements to identify what percentage of roles requires a technical degree or degree in Engineering. As seen from the data, 35% specifically ask for an Engineering or computer science degree, including roles in marketing and non-engineering departments. We see that 30% of the roles require at least 5-years, while 35% of roles need even more experience. So if you did not get hired at Google after graduation, no worries. You have a better chance after gaining a strong experience in other companies. The dataset does not have the geographical coordinates for mapping. 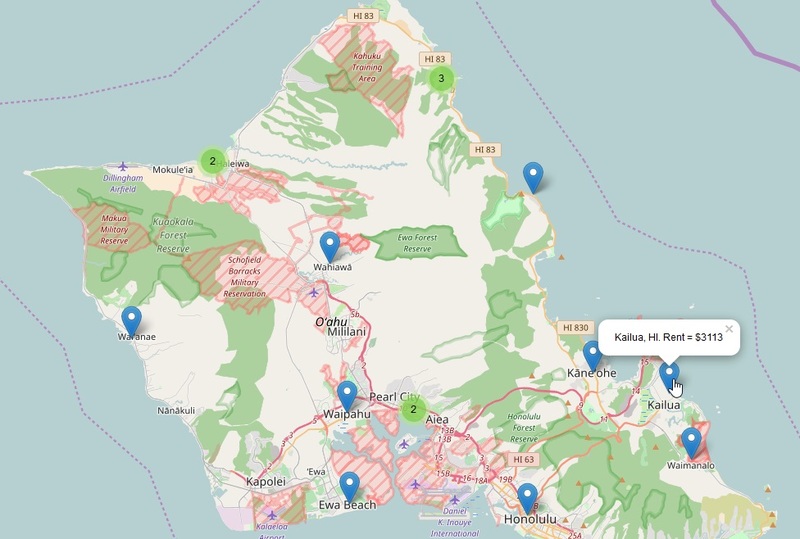 However, this is easily overcome by using the geocode() function and the amazing Rworldmap package. 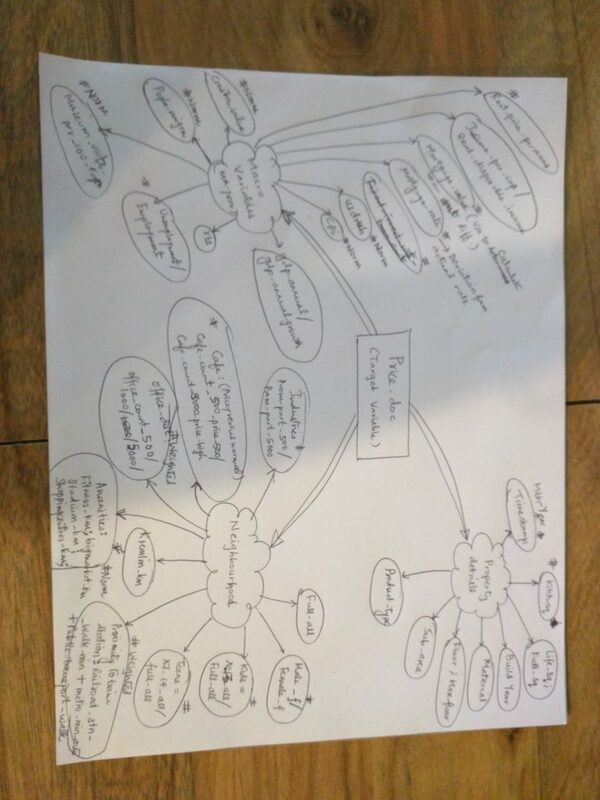 We are only plotting the locations, so some places would have more roles than others. So, we see open roles in all parts of the world. However, the maximum positions are in US, followed by UK, and then Europe as a whole. Let us create a word cloud to see what skills are most needed for the Cloud engineering roles: We see that words like “partner”, “custom solutions”, “cloud”, strategy“,”experience” are more frequent than any specific technical skills. This shows that the Google cloud roles are best filled by senior resources where leadership and business skills become more significant than expertise in a specific technology. So who has the best chance of getting hired at Google? Engineering or Computer Science bachelor’s degree. 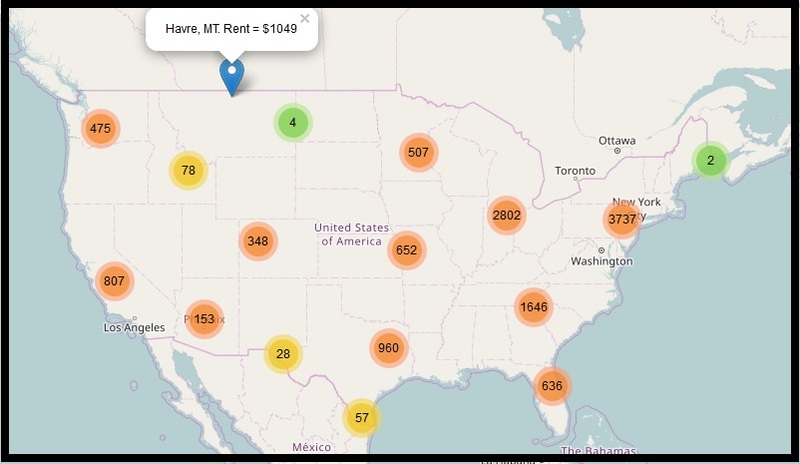 In this post, we will use the Zillow rent dataset to perform exploratory and inferential statistics. Our main goal is to identify the most expensive real estate cities in US. The Kaggle dataset contains two files with rental prices for 13000+ cities across the time frame Nov 2010 – Jan 2017. One file contains values for rent, the other has price per square foot. 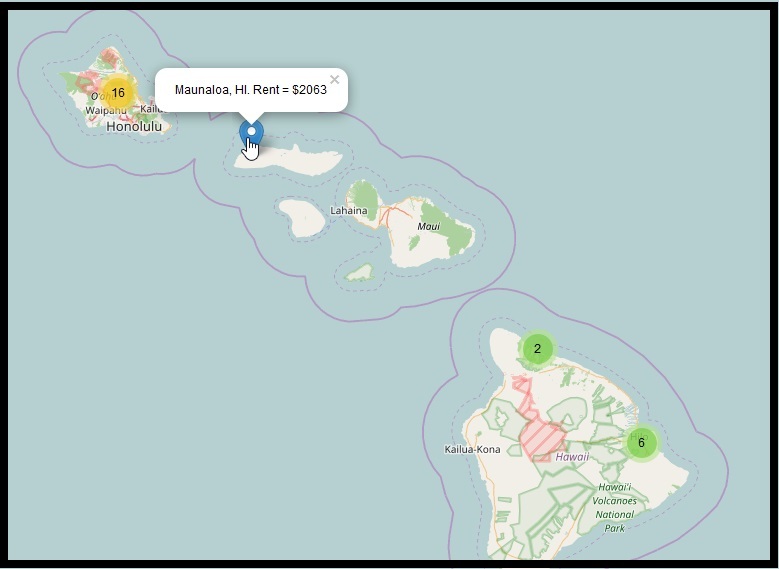 Additionally, we use a public dataset to map geographical coordinates to the city names. The main analysis does not need the latitude, longitude values, so you can proceed without this file, except for the last map. Although, having these values helps to create some stunning visuals. Feel free to use the location data file with other datasets or projects, as it contains coordinate information for cities in numerous countries. The location data file is quite large, so the fread() to read it and the merge() later will take a minute or so. 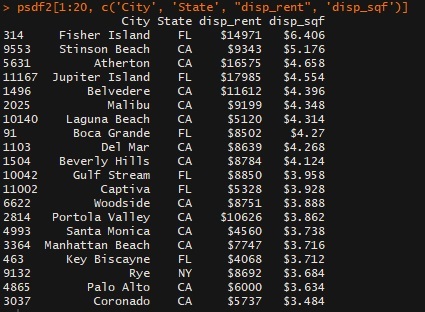 Most expensive cities in US, by rent. Most expensive cities by price per square foot. Which states have a higher concentration of such cities? 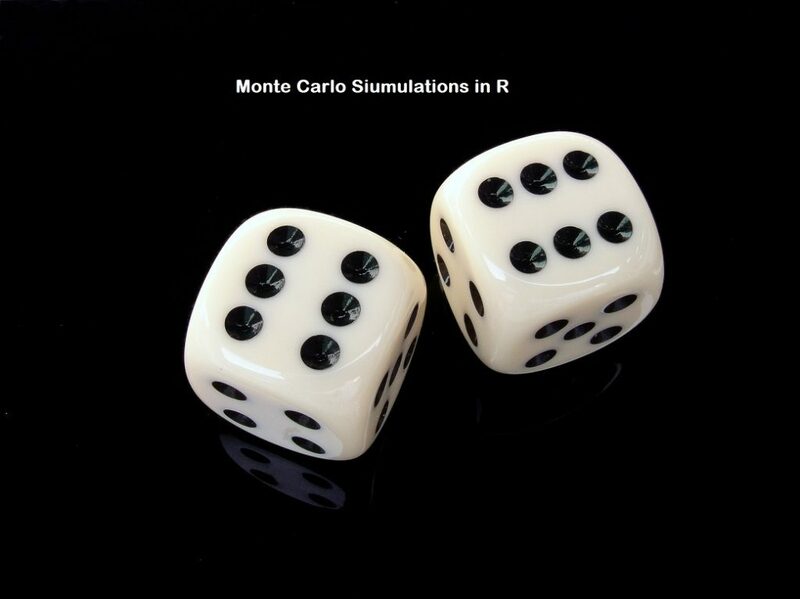 Please note that the datafiles and R-program code are available on the Projects page under Aug 2017. The Kaggle files are quite clean, without many missing values. However, to use them for analyzing trends over time, we still need to process them. In this case, the rent for each month is in a separate column, so we need to aggregate those together. We achieve this by using a custom for-loop. # is currently being processed. On a side note, if you are trying to massage data for reporting formats, say similar to a pivot table in Excel, then using similar for-loops can save you tons of time doing manual steps. We will also merge the latitude & longitude data at this step. Some of the city names don’t match exactly so we will use some string manipulation functions to make a perfect match. 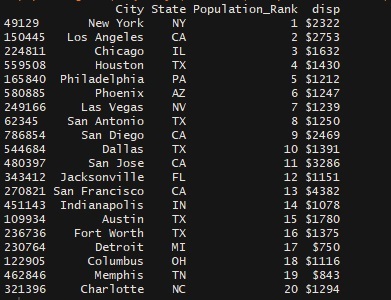 We will use the Jan 2017 month to do a ranking for parameters like population density, rent amount and price per square ft.
We use Jan data to sort the cities by rent amount, then assign a title similar to “Num. City_Name” . 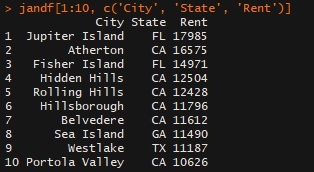 Take the list of top 10 cities and then merge with the original rent dataframe, to view rent trend over time. We notice that Jupiter island and Westlake see some intra-yearly rent patterns indicating seasonal shifts in demand/supply. Notice that the city names in the two lists are not identical. Jupiter island which was first in list 1, has moved down to spot 4. Similarly, a 2000 sq.ft home in Malibu CA would set you back by $9,000 per month! We also see that most cities in this list are predominantly in California or Florida. c) Cities with small area but huge rent!! Let us investigate which cities make you shell out tons of money for very small homes. We can calculate area using the price per sq. ft. and rent amount. # Are there any cities where renters pay exorbitant amounts for a small area? Not surprisingly, we see names like New York, Los Angeles and Chicago heading the list. We’ve added the geographical coordinates to our dataset, so let us try to plot the cities and their median rent. We will add a column for the text we want to display and use leaflet() function to create the map. Note the maps look a little blurred at first, after 10 seconds the areas look lot clearer as the maps load up. So you can see national & state highway, city names and other details. The zoom feature allows users to zoom in and out. Zooming to the left and down to view Hawaii. In such cities you have to pay $10,000+ as rent. For the cities where you pay a lot for homes smaller than 900 sq ft, we notice that Hawaii cities have a seasonal trend. Perhaps due to tourist cycles and the torrential rains. The most populous cities are not always the most expensive, although it probably means a lot more competition for the same few homes. What other insights did you pick up? Rank cities by highest rent price for some random months – Jan 2014, July 2015, Mar 2012, Aug 2013, Nov 2016, July 2011, Sep 2015. Do the top 20 lists remain the same? Different? Which state has the highest number of such expensive cities? If the answer is CA, which is the second most expensive state? Repeat steps 1-3 for price per square foot. Select a midwestern state like Kansas, Oklahoma, North Dakota or Mississippi and repeat the analysis at a state level. Please feel free to download the code files and datasets from the Projects Page under Aug 2017. In this month’s project, we will implement cluster analysis using the “K-means algorithm”. We use the weather data from 1500+ locations (near airports) to understand temperature patterns by latitude and time of year. Temperature patterns are similar towards the far North and South, just vertically shifted. The Pacific coast is different from the rest of the nation, where the temperature is static almost throughout the year. It is interesting to see how states in two different parts of the country show similar weather patterns since they are on the same latitude (see Minnesota and Maine). During peak summer, these two states are hotter than California. A sample graph from the analysis is shown below. Data set and code files are available from the main Project site page, under the row for Jul/Aug 2017. What happens if you increase cluster size to 7? What happens if you decrease it to 3? 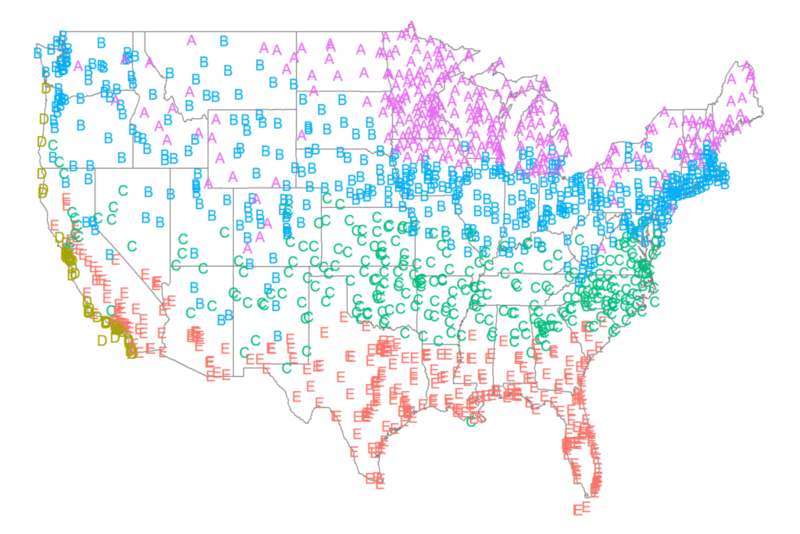 What is the monthly weather pattern for Hawaii (state code = HI) versus New Hampshire (abbreviation = NH) ? What is the weekly average temperature for a tropical state like Florida (plot a chart with median temperatures for all 52 weeks, by year). Has the average temperature gone up due to global warming? Please leave your thoughts and comments, or questions if you get stuck on any point.